In this paper we investigate error estimates for the approximate solution of operator equations \(Af=u\), where u needs not to be a function on the same domain as f. We use the well-established theory of generalized interpolation, also known as optimal recovery in reproducing kernel Hilbert spaces, to generate an approximation to f from finitely many samples \(u(x_1), \dots , u(x_N)\). To derive error estimates for this approximation process we will show sampling inequalities on fairly general Riemannian manifolds. 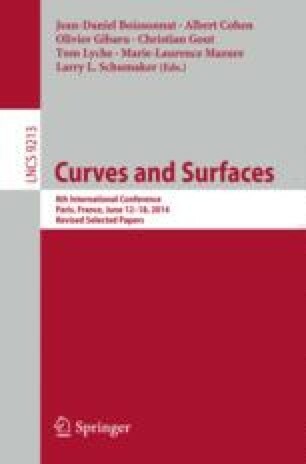 The author would like to thank Grady B. Wright for the possibility to gave a talk in the minisymposium ‘Kernel Based Approximation Methods’ at the conference ‘Curves and Surfaces’ 2014. Moreover he would like to thank Frank Filbir for fruitful discussions on the topic and careful proofreading.